My awesome dad just started cooking over the past year, thanks to the magic of the air fryer. He wasn't interested in cooking for pretty much my whole life, but a couple Christmases ago, my parents got an air fryer — and everything changed. My dad, who is semi-retired, started messing around with the air fryer and realized he had some serious kitchen skills. Soon, he was cooking entire dinners in the fryer so they'd be ready when my mom got home from work. From there, he branched into occasionally using the oven, the stovetop, and other appliances and gadgets. But I credit the air fryer with turning my daddy into a chef! 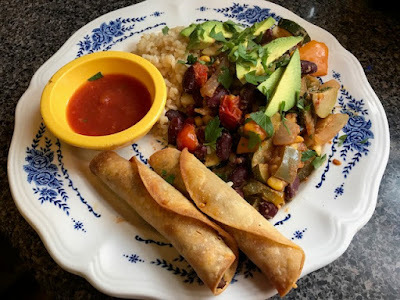 He recently made me some Vegan Beef & Cheese Taquitos — some of which he served fresh to me while I was in town and the rest he froze for me to heat in my own air fryer. I had some of the frozen ones yesterday with a little sauteed veggies, avocado, kidney beans, and brown rice. Salsa for dippin! He was nice enough to share his recipe, so I'm sharing with y'all! Coat a skillet with oil and heat to medium. Place one tortilla in the skillet, heat for a few seconds, flip, and heat the other side for a few seconds. You're just making them pliable here, so don't overcook. Cover cooked tortillas with a warm towel until ready to roll. As you're heating your tortillas, add a little more oil to another skillet. Add the onion and saute for 2-3 minutes or until soft. Add the beefless crumbles and taco seasoning. Heat for about 5-7 minutes, stirring occasionally, until lightly browned. To assemble, place one tablespoon of beefless crumbles and a half-tablespoon of cheddar in the center of a heated tortilla and roll up. 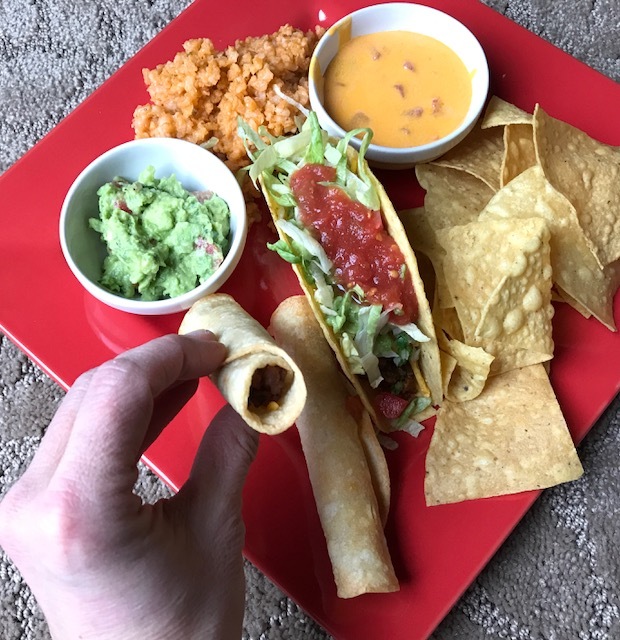 Use a toothpick to hold the taquito together. From here, you can cook immediately in the air fryer on 350 for about 8 minutes or freeze in plastic bags. To cook the frozen taquitos, simply heat in the fryer for about 10 minutes on 350 degrees. If you have leftover meat and cheese afterward, save it for nacho night! Or taco night! That's so awesome that your dad is now a chef!! And how great that he makes vegan food! He's got more talent than me, I tried to make homemade taquitos in the oven and they broke and cracked and it was a mess! These look seriously delicious! Thanks to your dad for sharing the recipe! I really want to look into getting an air fryer, everything always looks so good! That queso looks pretty awesome too. There are some amazing recipes here. This is on the list to try soon.